Mesoamerica, October 29, 2018 – The Mesoamerican women defenders who make up IM-Defensoras declare ourselves in rebellion and raise our voices in solidarity with the Civic Council of Indigenous Peoples’ Organizations in Honduras (COPINH) and the family of our companion Berta Cáceres in denouncing the numerous irregularities that make a deliberate farce of the trial for her political femicide and the attempted assassination of Gustavo Castro. In addition to these infringements and perversions of judicial prosecution, we decry numerous irregularities committed by Honduran criminal justice institutions since the beginning of the case, including a lack of access to information, the failure of the Public Prosecutor to conduct an investigation, the destruction and alteration of evidence, an unwillingness to pursue the intellectual authors, and a lack of protection of the rights of the victims, among others. 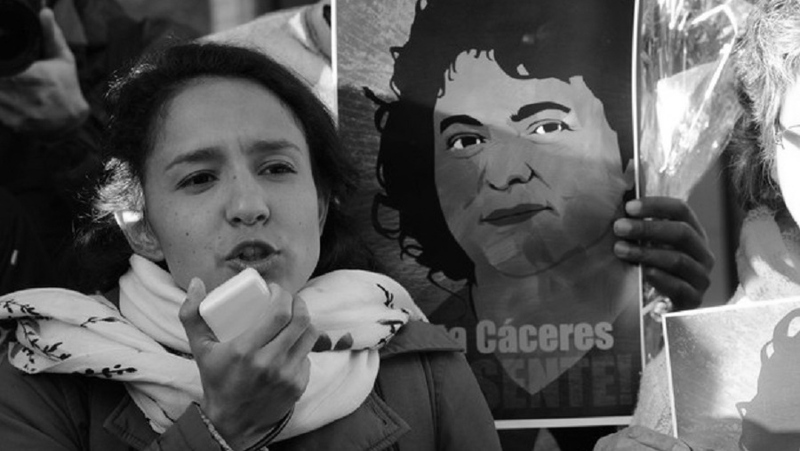 These factors clearly reflect an attempt to lay the foundations for lending the appearance of justice to a new exercise of impunity in order to protect the intellectual authors of the political femicide of Berta Cáceres and to elude acknowledging the responsibility of the State in this crime. Express our absolute support and solidarity with COPINH and the victims in the Berta Cáceres case. Demand the suspension of the trial until there is a resolution of the challenge to the Court that is hearing the case and a guarantee of representation by the victims. Repudiate and condemn the obvious strategy of the State in Honduras to provide impunity for the material and intellectual actors in the political femicide of our companion Berta Cáceres and to elude its own responsibility in this crime. Send out a call to the international community to show solidarity with COPINH, the family of Berta Cáceres and Gustavo Castro, and stay on the alert for developments in the case.